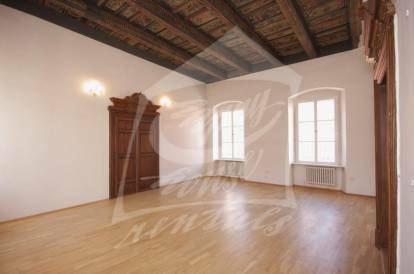 We are offering this spacious, fully furnished three bedroom apartment with terrace for rent, situated on the fifth floor of a building with an elevator in Prague 1 - Old Town. Location surrounded by historical sights of old Prague, culture lovers will appreciate the close proximity of “National Theatre” divadlo. The apartment comes fully furnished. Kitchen with a refrigerator, a hob, oven. Two bathrooms with showers, two separate toilets. Telephone connection, internet available. The whole apartment is lined with hardwood floors and tiles. “Národní divadlo” tram stop 3 minute walk from the house. Utility fees billed separately, safety deposit equals to two monthly rent. Interested in this property, ID 24635? Our agent Zuzana Pokorná will take care of you.